When Flipkart opened it’s marketplace last year, they did not have a fullfillment services. 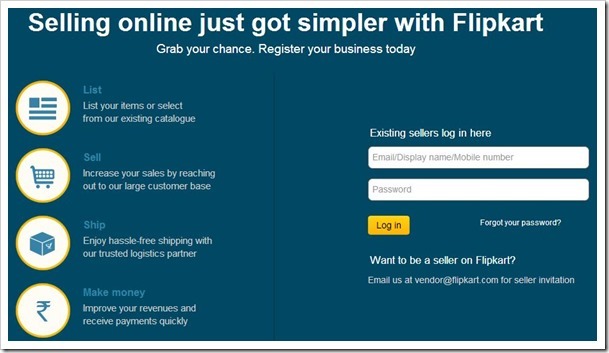 However, now it looks like Flipkart has started with their own fullfillment and logistics service very similar to Amazon, and it is called Flipkart Advantage. You can see more details on Flipkart Advantage here. As per the new service, the third party sellers will need to stock their products in Flipkart warehouses before the orders are placed, so as to ensure quick deliveries. Most large E-Commerce sites in India are now expanding their online products catalogue through marketplace model, where they allow 3rd party businesses to list their products and sell on their platform. This is a win-win for all including the buyer, 3rd party sellers and E-Commerce site itself. Flipkart is the latest to join the bandwagon with announcement on their own marketplace. They currently have 50 sellers on-board. Other Indian sites like Infibeam, Tradus, Shopclues etc. have been operating the marketplace model quite successfully. Flipkart is currently bringing sellers on-board on “invitation basis” only. Interested sellers will currently need to send an email to [email protected] or visit sellers.flipkart.com to register. Once a seller is approved on Flipkart Marketplace, they can list their own products or choose from the existing list of products that Flipkart has. They can choose their own pricing and Shipping details and list the products, which once approved, will be listed on Flipkart’s main site. Because Flipkart has its own logistics in place, these 3rd party sellers can take advantage of the same and when the sale is made, Flipkart will transfer the money to sellers on periodic basis. Some of the features that Flipkart offers to its customers like Cash on Delivery or EMI options will be extended to 3rd party sellers as well. for E-Commerce Sites: The host site is able to expand its catalogue of products without having to tie-up with Individually with multiple distributors and manufacturers. Also, to implement this model, they don’t need much investment as they use their existing platform and Infrastructure. For Third Party Sellers: For 3rd partly sellers, it becomes an excellent proposition, as they are able to offer their products to a much larger audience without spending too much money. They can leverage site’s existing Infrastructure, their backend and frontend to list and sell their products. For Buyers: For buyers, the biggest advantage is that they can avail cheaper prices on products due to presence of competition among multiple vendors selling same products. Additionally, they get bigger choice of products and brands at a single place. "Flipkart Opens Marketplace for 3rd Party Sellers", 5 out of 5 based on 1 ratings. Heard about your distributorship/dealership contracts, would like to sign your contract. I am interested on your service. I want to open distributorship in my New Palvoncha located in Khammam District 507115 Area and it’s surrounding areas also. so pls kindly help me.i need your kind information. Regards Md. Esrar Ahmed, ph no :+91-9603354654. Hi Sir/Mam, My self Rakesh Mewada and i heard about the services provided by you. Respected sir/mam i want to work with you by open a center in my location ujjain Madhya Pradesh and work for you. I am very willing to work with you. Kindly sir tell me about the system and necessary documentation to open an center. there is no service of flipcart in my area,it has a huge potencial,i want to start a distribution system here.i want a distributor ship or some other model. I have already distributorship business and i am intersted in flipkart delivery business. I have capacity to invest in business. I am from amravati M.H. 9923297898. I am Nabajit Nath from Assam.I am interested on your service. I want to open distributorship in my area.so pls kindly help me.i need your kind information. Hi Sir/Mam, My self Rakesh Mewada and i heard about the services provided by you. Respected sir/mam i want to work with you by open a center in my locationShajapur Madhya Pradesh and work for you. I am very willing to work with you. Kindly sir tell me about the system and necessary documentation to open an center. My self Kamlesh Kumar and i heard about the services provided by you. Respected sir/mam i want to work with you by open a center in my location Mohali Punjab and work for you. I am very willing to work with you. Kindly sir tell me about the system and necessary documentation to open an center. Sir we have well 3years experience with Airtel DTH and field service with best services. Kindly give us one chance to work with you. it’s really a good news for end users that they are now following ebay and tradus model. BUt one question: will the 3rd party be able to compete with inhouse flipkart products. what about the customer support. So it seems like Flipkart also sources their products from the same sellers. As the article mentioned, Sellers are currently signed up on invite basis only; and plus when you make a purchase, you will notice that Flipkart also is sourcing the product from the same seller. Also, with reference to competing, it seems like the Retailers need to pay a certain advertising fee for Flipkart to display their details. I am assuming it works on a PPC basis since I believe that’s how Amazons Market place functions. Customer Support I am not sure about though. I guess Flipkart should handle that, or it could end up adversely tainting their brand.